Mode for making blueprints of your prison. Animated example of using planning mode to lay out a floor plan and building a foundation over it. The Planning feature is used to plan your upcoming buildings and room layouts without the fear of workers actually building anything. You can draw in the usual way with the left mouse and clear with the right mouse. 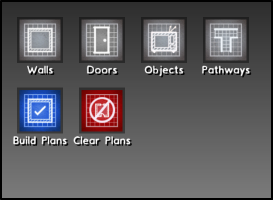 Plans are automatically cleared once walls are actually built by workers, or they can be removed by right-clicking in the Planning mode. This page was last edited on 21 November 2016, at 13:14.